Ino was a queen of Greek mythology, but though born a mortal, she would be transformed, at the moment when she should have died, into a sea goddess. ​Ino was born in Thebes, or Cadmea, as it was then known, for Ino was the daughter of the founding hero Cadmus, and his wife, Harmonia. Thus, Ino had two brothers, Polydorus and Illyrius, and three sisters, Agave, Autonoe and Semele. ​Ino comes to the fore though, not in Thebes but in the nearby city of Orchomenus, for Ino would marry the king of Boeotian Orchomenus, Athamas. 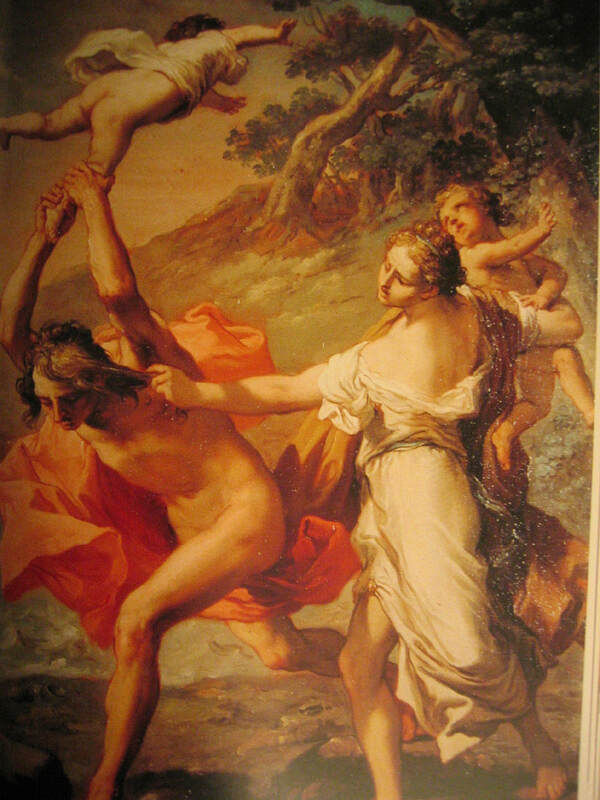 Ino was the second wife of Athamas, for Athamas left the cloud nymph Nephele for the beautiful Ino, although not before he had become father to two children, Phrixus and Helle. Ino might have supplanted Nephele in the affections of Athamas, but she was extremely jealous of Phrixus and Helle, a jealousy only heightened when she bore two sons for the king, Learches and Melicertes. Wishing to ensure that Learches would be the future king of Orchomenus, Ino plotted the removal of the older Phrixus from the succession line. Ino would use her position as Queen of Orchomenus to bribe the women folk to spoil the crops, resulting in a famine; a famine which was then blamed upon Nephele. Athamas would then send a herald to consult with an oracle, but unbeknownst to Athamas, this herald had been bribed by Ino to bring back not the words of the oracle, but the words devised by Ino. Thus, the herald informed Athamas that the famine would only be lifted if Phrixus was sacrificed to Zeus. The populace heard the “words” of the oracle, and urged King Athamas to do the deed. Before Phrixus could be sacrificed, the son of Athamas, and Helle, were rescued by the Golden Ram, an animal sent by their mother, Nephele. Phrixus and Helle would leave Boeotia, heading for sanctuary in Colchis, although, in the end, only Phrixus reached safety in the far away land. Phrixus might not have been dead, but Ino had achieved her aim, for Learches was now the most likely successor to Athamas for the throne of Orchomenus. ​Shortly afterwards, Ino and Athamas were visited by the god Hermes, who brought with him the baby Dionysus. Dionysus had just been born from the thigh of Zeus, having previously been in the womb of his mother, Semele. Semele was of course sister to Ino, and a former lover of Zeus, who was killed through the conniving of Hera. Zeus now needed someone to raise Dionysus, and his aunt, Ino was the logical choice, although Hermes advised Ino and Athamas that it would be best to disguise Dionysus as a girl, lest Hera discover his presence in Orchomenus. Now such a simple disguise did not fool Hera for long, and upon discovering that Dionysus was in Boeotia, she sought her vengeance upon the illegitimate son of her husband. Hera would rouse the Erinyes into action, resulting in Tisiphone exiting the Underworld, with Maniai (Madnesses) in her company. ​Tisiphone would ensure madness was brought down upon Athamas, who now saw not his son Learches, but a deer that needed to be hunted, and Athamas would kill with an arrow. Some say that Athamas then saw not his wife Ino, but a lioness, which likewise needed to be hunted; before she could be hunted down though, Ino fled, with her other son Melicertes, in her arms. Now whether madness had also taken over Ino, or whether she had no other place to go is not clear but Ino, and Melicertes, would plunge over the edge of a cliff, into the sea. Dionysus would be whisked to safety, disguised as a goat. ​There is subsequently a divergence in tales when it comes to Ino afterwards, and in the event that the fall into the sea did not kill the wife of Athamas, then perhaps she lived on, becoming a Maenad, a follower of Dionysus in the Boeotian hills. In this version of the tale, Athamas would later discover that Ino, and children were still alive, although by this time he had been exiled to Thessaly, and had married for a third time, to Themisto. Athamas would call for his former wife and children to join him in Thessaly, although this means that neither Learches nor Melicertes had previously been killed. The children were said to have arrived in Thessaly, but this only aroused the jealousy of Themisto, who had also born children for Athamas. Themisto would now seek to do away with the children of Ino, and bade a slave to dress her children in white, whilst Ino’s children were to be dressed in black; and then, in the night, Themisto killed the two children in black. The slave whom Themisto talked to was an unrecognised Ino, and fearing some mischief, Ino had swapped the colours around, so Themisto had unwittingly killed her own children, instead of those of Ino. Themisto would subsequently commit suicide, and it might be presumed that Ino afterwards lived out her life with Athamas. ​There is a more common story told of Ino after her plunge from the cliff, and it is one which again sees Ino not dying from the fall, but instead she is transformed into a sea goddess, Leucothea, the “white goddess”. At the same time Melicertes would be transformed into a sea god Palaemon. The transformation of Ino is normally ascribed to Zeus, grateful for the care that Ino had given to Dionysus, although some say that it was the baby Dionysus who undertook the transformation. Ino, as Leucothea, appears in the trials and tribulations, for in the Odyssey, with Odysseus clinging onto the last remnants of his ship, Ino comes to him and gives him a scarf which will ensure that he doesn’t drown in the storm waves produced by Poseidon. It is this scarf that allows him to swim for two days to the island home of the Phaeaceans, the last stopping off point before he returns home to Ithaca.